We take care of your animals as we would our own! After this consultation, our veterinarians are authorized to give you a medical prescription for your animal or will recommend extending the visit with various diagnostic tests that are on site. This will help us better evaluate your pet’s medical health. The Fontainebleau Veterinary Clinic will always accept emergencies, as long as the staff is present in the clinic. You can come at any time if you feel your pet needs to be seen immediately (extra fees may apply). If your animal is in a critical state, our staff will see you as soon as you walk in the door (if other appointments are scheduled, extra fees will apply). 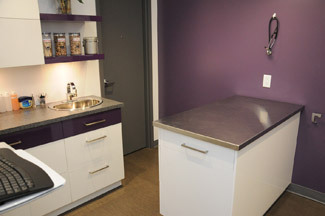 All routine surgeries are performed at the clinic, such as spays, neuters and declawing. On larger breeds such as Great Danes, German Shepherds, Dobermans and more, we recommend to attach the stomach (preventative gastropexy) in order to avoid stomach torsions. Every animal has an intravenous catheter with calculated saline solution before, during and after the surgery. No more than 3 surgeries a day are scheduled to insure that the appropriate time and surveillance are given to your beloved pet. A full examination is done before the surgery and a veterinary technician will meet with you in the evening following the procedure to explain what must be done at home and how to administer the anti-inflammatories that are prescribed. Soft tissue surgeries are also done at our clinic, for example, mass removals and many more. Ask our qualified staff for a quote and they will answer all the questions you might have. Our qualified staff performs all types of emergency surgeries such as, foreign body removals (gastrotomy, enterotomy, enterectomy), cesareans, uterin infections (pyometra), eye removals (enucleation), bladder stone removals (cystotomy), hernias, stomach torsion and many more. Ask our qualified staff for a quote and they will answer all the questions you might have. The Fontainebleau Veterinary Clinic is equipped with a top of the line dental machine, digital x-rays (see below) and table to insure the best results in the quickest time. Therefore, your animal will be under anesthesia for a shorter period of time all the while being very comfortable on a specifically made table for this effect. Also, the equipment is specially designed for easy teeth removal, which causes very little gum swelling and pain for your beloved pet. Blood samples are often used during veterinary consultations, in order to confirm or to clarify a diagnosis. Analysing your animal’s blood allows us to gather a large amount of information. It is a major examination when we want to confirm a large amount of problems. The most common pathologies that are diagnosed in animals are: kidneys, liver, thyroid, infectious diseases and diabetes. Many other illnesses are and can be diagnosed on site. This great advantage will let us treat your pet as quickly and as efficiently as possible. For many pathologies, such as respiratory, cardiac, abdominal, bone and others, an X-ray examination is very often required for a more precise diagnosis. With the DR technology, an image is obtained within 4 seconds. Because of this top of the line technology, the images can be enlarged and early onset illnesses can be diagnosed and prevented. Also, a rapid interpretation by a specialist is possible because these images can be sent via email within seconds. 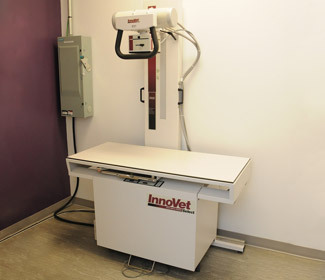 The Fontainebleau Veterinary Clinic is equipped with a digital dental X-ray machine. A radiological examination of your animal’s teeth allows us to objectivize certain dental lesions that are not visible to the naked eye. The X-rays make it possible for us to evaluate the extent of the lesion and to give the appropriate treatment for the problem encountered by your four-legged companion. Also it insures that the tooth removed is complete and not partial. If part of the root is left in the socket, it can cause pain for your beloved pet. Our anesthetic system is at the leading edge of technology and functions with the anesthetic gas, isoflurane. 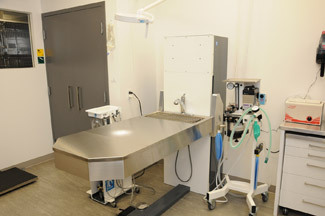 This Veterinary Clinic is equipped with a system in the surgery room, in the treatment room, as well as the x-ray room. Therefore if your pet is undergoing surgery and needs a post-operative x-ray, you can be reassured that the entire anesthesic procedure will be safe and stable. It will guarantee you a perfectly measured dosage of anesthesia, in order to avoid any unnecessary pain to your animal. Also, high-end equipment is used to monitor blood saturation, pressure, heart rate, and more during the entire procedure. This equipment and the constant surveillance of our qualified staff provides a safe, efficient and stable anesthetic procedure. 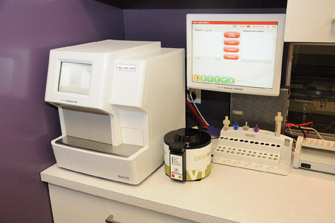 The Fontainebleau Veterinary Clinic is equipped with a leading computer system, provided with the very successful program, Cornerstone. 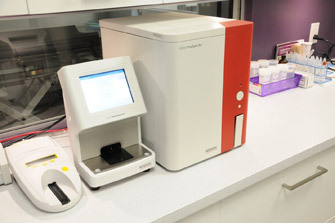 This equipment allows the clinic to give a client service of exceptional quality and an impressive and reliable monitoring of files. For your animals’ well-being and optimal health, offer them the most appropriate care at the Fontainebleau Veterinary Clinic.